Kota Bharu airport will be upgraded to accommodate full code 4C aircraft operation .The main works will include the upgrading of the infrastructures in the airside. The work on the extension of runway will start on the 3rd October 2010. All works are slated for completion by September 2011. When completed, the runway length will be 2400 metres (2.4 kilometres). This is the proposal of the development. for completion by September 2011. 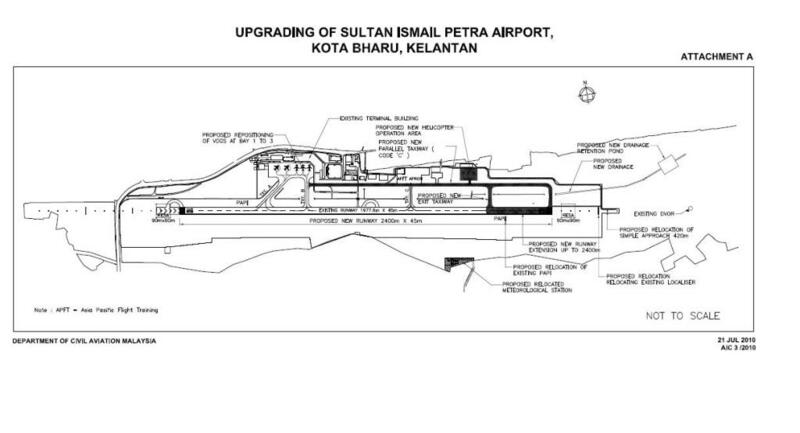 2.1 The purpose of this Aeronautical Information Circular (AIC) is to provide advance information and advice regarding the scope of works pertaining to the Kota Bharu Airport upgrading programme. This AIC will be followed by a number of AIP Supplements that will provide details of the upgrading works, introduction of new facilities and revision to the existing procedures. 3.1 The existing runway length of 1981m x 45m will be extended from Threshold Runway 28 by 491 meters. When completed the runway length will be 2400m x 45m. Runway End Safety Area (RESA) of 90m x 90m provided at both runway ends. 3.2 A new partial parallel taxiway will be introduced to connect the Parking Apron to Threshold Runway 28 and, in order to improve aircraft movement, a connecting taxiway will be provided at 2000 meters from Threshold Runway 10. 3.3 The existing VDGS at Bay 1, 2 and 3 will be repositioned to meet separation distance requirement Code C aircraft. 3.4 A new apron for helicopter operation will be provided. 3.5 The existing meteorological station will be relocated to a new site. 3.6 Airport drainage system, security fencing and airside perimeter road for the extended area will be provided. 4.1 A new Aerodrome Ground Lighting (AGL) will be provided for the extended runway, new parallel taxiway and connecting taxiway. 4.2 The Simple Approach Lighting System for Runway 28 will be relocated at new position for the extended runway. 4.3 PAPI for Runway 28 will be relocated to the new position. New threshold lighting and markings for Runway 28 will also be provided. 4.4 The existing ILS Localizer will be relocated at new position for the extended runway. Detail of downtime of the ILS Localizer will be published in AIP Supplement. STARs will be introduced to improve traffic flow. Non precision approach and landing procedures will be made available including RNAV procedures. Air routes will be adjusted with relevant charts revised. « 1 Residence: Kondominium Baru di Kota Bharu. what rationale is there by making KT airport international and not KB, when with sheer evidence that the passenger load at KBR is more than doubled that of KT’s. And KBR is just serving domestic routes only. its all about politics, as simple as that. Huge gap between the passenger in KBR and KT doesn’t matter. You can get extra information about KBR and KT airport here. http://www.malaysiaairports.com.my/index.php/component/content/article/14.html see the traffic movement for the past three years between two airports. 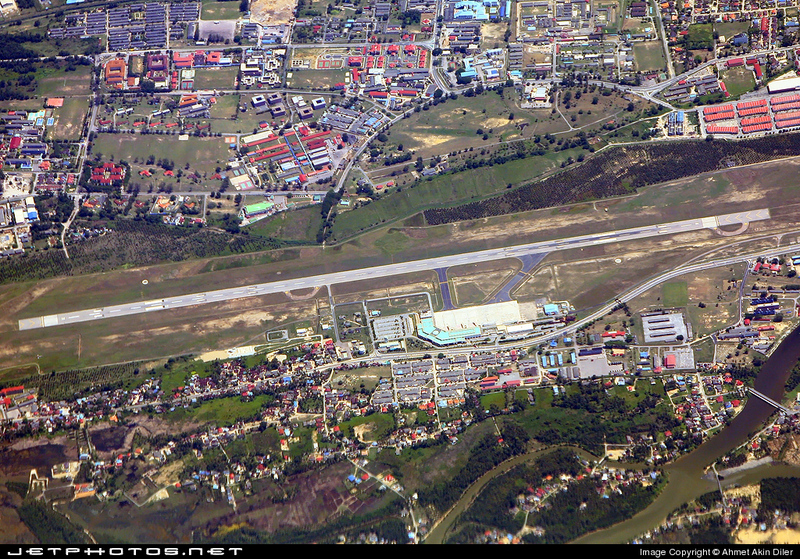 It could be due to the aircraft movements of the APFT, the Asia Pacific Flight Training school. I understand that even the Garuda Airline sends some of their pilots to train there. Alor Setar could be due to the RMAF is there. KBR is the only domestic airport which has surpassed the 1 million mark passenger load for 2010. Firefly has planned to fly it’s bigger aircraft between KB and Penang and KB and Langkawi, and Air Asia has plan to start the KB Bangkok service. KT is not even in the plan at all. There are a lot of Kelantanese businessmen who have their businesses in Thailand, particularly in Bangkok, thus they have to cross over to Narathiwat to catch a flight to BKK. In fact Thai International has for a few times applied to fly to KB but was turned down by the Federal government due to the obvious reason. since trip from KL to KB will going to take 7-8 hours, Airsia and MAS seem affordable and saving time for those who work in KL whilst staying in KB. 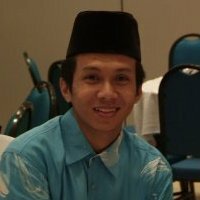 A lot businessman from Kelantan who work in KL back and forth.